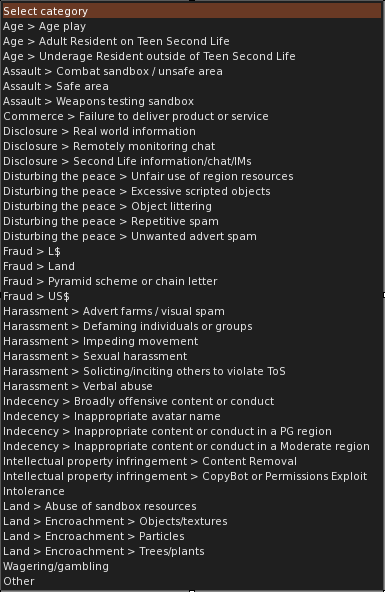 The next release of the Firestorm viewer will include the new Abuse Report categories that are currently available on the default Linden Lab viewer. Currently, Firestorm shows the old list of 38 categories. The new category list (as shown on the current LL default viewer) has been simplified to only 14 categories. Here are the changes, and some of them are surprising. This is the exact definition of Assault from section 3 of the Community Standards. The two deleted categories were somewhat subjective anyway. I wonder how to report a problem if the fraud is in Euros. That seems like a good “catch all” definition. This was another example of obsolete terms being removed. It’s still intolerance, simply a single word. Apparently tree encroachment is not a big enough problem to need its own AR category any more, LOL. For those of us who report abuse every day in opposition to griefers, there are several problem areas in the revised AR categories. We will be unable to report underage residents in Second Life using the new AR form. Community Standards section 4 still states that “Remotely monitoring conversations in Second Life, posting conversation logs, or sharing conversation logs without the participants’ consent are all prohibited,” but we cannot report these violations using the new AR form. This is a common violation that we see all the time. 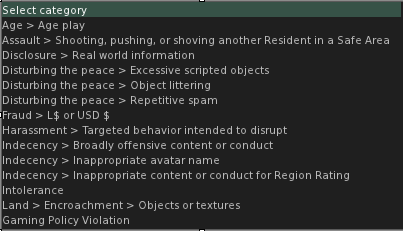 If, as the Community Standards states, “Residents are entitled to a reasonable level of privacy with regard to their Second Life experience,” then the prohibited sharing of inworld chat logs warrants its own AR category. There is no longer an “Other” category, so residents cannot report problems that do not fit into one of the current 14 categories. For example, what if someone is impersonating a Linden or another resident? How do we report someone whose account has been hijacked, where the griefer is sending out fake Marketplace links? There are many different situations that are Terms of Service violations that we cannot report, using the new AR form. This is an important change for peacekeepers, who write Abuse Reports almost every day. Because most of us use Firestorm, we may not have been aware of these changes. The new AR form will be released with the next revision of Firestorm, though, so we will be faced with a simple form that does not do everything that we need. If the situation is not fixed, we may have to start submitting Support Cases or using Live Chat as a workaround to report problems. Gallery | This entry was posted in Linden Lab. Bookmark the permalink. That is a good point, but I wonder if that forum is monitored at all times. it isn’t, and it’s explicitly NOT intended for reporting people. In fact naming residents in a negative way (which calling out abuse by someone would be) is “naming and shaming” and will get you banned from the forums. Of course you can and should just pick the nearest matching category and use that. So fake MP links for example become “fraud, L$ or US$” as that’s the intent of the scams. LL’s rules for the use of Live Chat and the Support portal expressly state that its workers cannot and will not respond to reports of abuse or griefing, so that isn’t an option. I’m sorry to see some of the other categories go away, especially since “Other” is one of them. However, we should still be able to submit ARs on the other violations, by simply choosing the closest available category and providing adequate explanation. I was scammed out of my entire savings (69K L$ = approx $250 US) before Christmas last year. I duly reported it with copies of the incriminating convos, Now, three and a half months later the avi who scammed me still appears in search and i haven’t recieved a single Linden back, so my question is this: as LL, despite their enormous power, refuse to give ANY FEED BACK whatsoever, what is the point in making ANY Abuse Reports? An in world scam like that would be a “conflict between residents” and therefore explicitly not handled by the Lindens. If you give someone money and they run with it, nothing they will do about it. And rightly so. Otherwise they’d be swamped with people fraudulently complaining about poor service from vendors and things like that and effectively scamming a store or service provider by demanding the Lindens refund them their purchase. This would hit land rental agents especially hard. Rent a sim or parcel, pay a month in advance, and at the end complain to the Lindens about the lack of service and you get your money back, effectively defrauding the rental agency. And no, the Lindens won’t tell you what if any action is taken on your reports. As it should be, to prevent vigilantism, people being hunted down by irate residents after their unwarranted ARs went unactioned. Someone named Startnewlifeagain is returning objects that are not set to be edited by others and it is saying “Governor Linden” returned them. I haven’t seen this before. The person definitely wasn’t actually a Linden. Ive been harassed for 3 years and my personal information scattered all over sl. Chat logs shared …everything. I reported him daily. LL did nothing though he kept going. He has harassed others thinking its me. Report after report, and LL acts like they never heard of the TOS. Would be nice if the truth were known. Linden Labs TOS is a joke.